What does swimming in a pool, drinking through a straw, breathing in air, and circulating blood all have in common? They all require a form of air or water pressure! 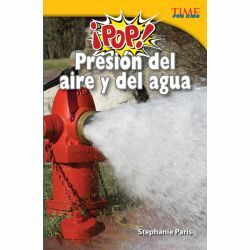 Readers will discover the variety of ways that air and water pressure make an impact on our lives and the things in them. This fact-filled, Spanish-translated nonfiction title includes real-life examples and basic experiments to aid in the development of understanding physic and scientific concepts. Readers will be introduced to and learn about Archimedes Principle, atmospheric pressure, vacuums, water density, and hydraulics through the use of informational text and stimulating facts in conjunction with vivid images and helpful graphs and diagrams.